This collection of poems of approximately one hundred pages hits on many of the issues so important to the teens of past and present generations. The author organizes her poetry collection by age rather than theme; the poems become more sophisticated and complex as the chapters and maturity levels progress through time. Poems are listed by title only, the reader must peruse through to the end to find the theme. But the underlying themes match the trials and tribulations that coming of age brings upon all of us. Several of the poems relate sorrow at not having a mother present while growing up. At age twelve the author writes about her “best friend forever” Renee. There are poems expressing fear and frustration, relationships with boys, and feeling left out of things. Many poems express hope and optimism like “The Stars,” “My Shadow,” and “What You Do.” In the very last section of poetry written in the period from ages twenty-two through twenty-seven, the author finds her true love, David, and then becomes the mother of Kayleigh in whom she places her hopes and dreams. 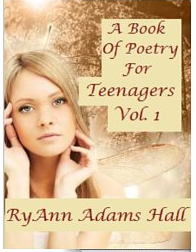 I think many that teens will enjoy having these poems to read as they pass through the many moods, phases, ups and downs of adolescence. Nice book to have when you feel the need to take a moment or two to reflect on the joys and sorrows of growing up and life in general. 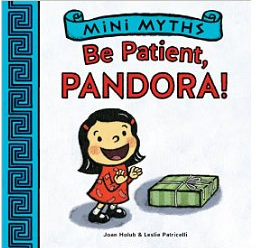 Reviews of two books in the Mini Myths Series: Be Patient, PANDORA! and Play Nice, HERCULES! At first glance, you might say how could a toddler possibly understand the connections between Greek mythology and a toddler’s learning curve, but you are mistaken. Holub has deftly taken the story of Pandora’s box and woven it into a wonderful twenty-four page toddler board book. Each page contains a picture, one word or one sentence to portray a tot named Pandora, who simply cannot contain her curiosity when her mother tells her not to open the box. She cannot resist and then fears rejection and loss of her mother’s love when her curiosity gets the best of her. Patricelli knows exactly how to convey the story in pictures that are so simple yet expressive with the generalization needed for young children to understand the plot. This book has more text than the first, but does not go beyond one sentence on a page. Hercules is a toddler who has a habit of getting into mischief. Patricelli says it all in the wonderful facial expressions in her character. Dad warns him to play nice with his little sister who is sitting on the floor with her blocks. You can guess what happens when Hercules decides to display his strength. I especially enjoyed the way Holub used sound words like whomp-stomp and ka-boom to combine pictures and actions of the story. Mighty Hercules will have to learn how to contain his powers, and the siblings will learn a valuable lesson in the process. Both sturdy board books contain summaries of the Greek myths upon which they are based on the back cover of the book. 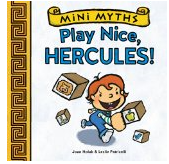 This is particularly useful for adult readers who may have forgotten the story and also allows the young child to “grow into” an interest for classical Greek literature at a later point in time. Parents and teachers may use the series as an early introduction to fine literature as well as a way to teach the skills and values that toddlers are beginning to develop. If you enjoyed reading these reviews, please subscribe by clicking on the word Follow or by hitting the orange RSS Feed number in the upper right hand corner of this page. William O’ Brien is not only a talented storyteller but a gifted poet as well. This collection of poems is meant to accompany his children’s book, Peter, The Darkened Fairytale. In that story, Peter is the protagonist who must fight and overcome the forces of evil. These evildoers will seize all. These words present a challenge that most children will be glad to take up! There are silly poems like “Wandering Twondle” and “Cuthbert,” scary poems like “Devil’s Wish” and “Zombie Queen,” and fantasy creature poems titled, “Elves and Goblins,” and “The Vaandorg Dragon.” Some of the nature poems remind me of William Wordsworth. 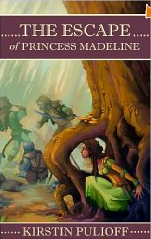 The author employs alliteration, personification and metaphors to make the reader feel that she is on a magical journey to a very special place. So close your eyes and lose yourself in the recesses of your mind. Tweens, teens and adults will enjoy the ride. 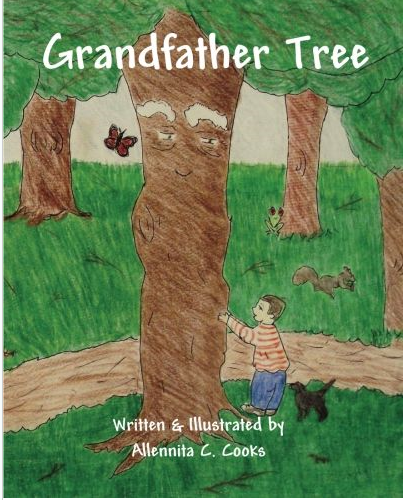 Grandfather Tree is a simple book that makes quite a statement. The author has spent many years reading to and working with young children. She has also written skits, poems and short stories and is a member of the Florida Writer’s Association. This book is her first attempt at illustration; it succeeds because the simplicity of color and image works well with the succinct but powerful text. An unnamed young boy and his dog are walking through the forest. He encounters a tree that reminds him of his grandfather who is strong and tall. He asks the tree, “Do you think of me?” He thinks of his life before as a baby and asks the tree if it remembers that part of its life.. He ponders about what life will be like when he grows up and asks if the tree would miss him coming to play with it. The boy expresses his fear of thunder and lightning and wonders if the tree is also afraid. Then he talks about the seasons using age appropriate analogies: the tree’s dropping leaves are compared to his hairs falling down when he gets his hair cut. He expresses his doubts to the tree. The boy wants to believe that this tree will always be there for him even when he grows old. However, he is unsure and afraid because he does not know what the future holds in store for him. Throughout the story, the author integrates the boy’s thoughts into the story by showing a picture of what he is imagining and thinking in a bubble next to the tree. The facial expression of the tree changes as the story unfolds as well. The author believes the book appropriate for ages four through ten. The simple pictures and the fact that there is only one rhyming line on each page make the story easy to follow. Older children will recognize the deeper layers of meaning in the story. The book is beautifully and lovingly done. Grandparents especially will want to include this book in their library. If you liked this post, please subscribe by clicking on the word Follow at the lower right or hit the orange RSS feed button at the upper right hand corner. Hamilton Troll is the story of a likeable little Troll named Hamilton, who is just about the size of a mouse. He is a cheerful person and has many friends in the forest. The tiny green troll has a big problem every time it rains. His shelter is merely a hole in a tree stump which floods and threatens to drown him! So poor Hamilton cowers in fear each time the rain approaches. His fall back plan is to hide under a plant with elephant like ears which he calls the Flop Away Home. One day as the sun emerges following a thunderstorm, Hamilton hears singing. 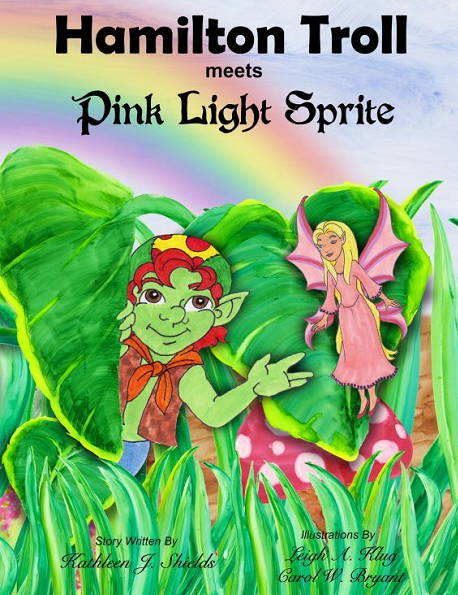 He finds a beautiful Pink Light Sprite Fairy who has been grounded because her wings are soaked. She must wait until they dry to take flight again. Pink Light Sprite befriends Hamilton and gives him some good advice. Why doesn’t he move one of those plants over his tree stump home? Then when the rains come, he will be protected. They go off to talk and play, but all too soon, Pink Light Sprite’s wings are dry. Hamilton is afraid; who will protect him when she leaves him? Pink Light Sprite reassures him that he will be safe now. Whenever he needs her, he has only to dream of her and the love and friendship that they have for one another. Hamilton has learned not to fear the unknown and to care for others who might need him. If you enjoyed this post, please subscribe to this blog by hitting the word Follow on the bottom right or click on the orange RSS feed button on the top right.